Put me down for 1 oz of shot to SA. I would like to donate one ounce. I would like to donate 2oz. 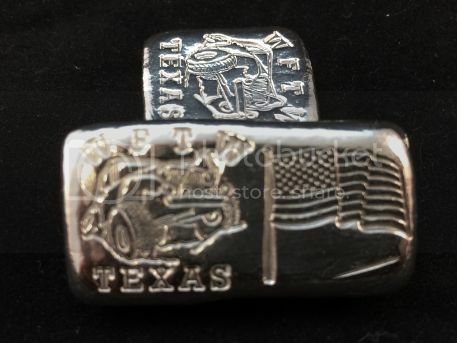 from the SA silver ETF. By the way, how many wounded soldiers show up at this event? Storm Drifter wrote: By the way, how many wounded soldiers show up at this event? I think it can vary from 50 to several hundred soldiers, plus their families. The Wheelers send buses out to the various forts to pick up wounded soldiers and their families. If I'm not mistaken, last year there was one fort that denied their people leave. Hard to say how many will actually be there throughout the event. It would be an honor to donate 2 ounces. SA let me know how I can send you funds for the shot you already have! Hey SA, You can bump my donation up to 2 ounces please. I have just put payment in a envelope to you coming via, T.T.A. AKA Tied To A Turtles A$$ AKA U.S.P.S. Ya'all have a great time at the event, wish I could join in the festivities but the timing is not right with having 2 kids maybe next years or so. East Texas "Longview Area" was my home base while I was overseas. Storm Drifter wrote: Hey SA, You can bump my donation up to 2 ounces please. I have just put payment in a envelope to you coming via, T.T.A. AKA Tied To A Turtles A$$ AKA U.S.P.S. Ya'all have a great time at the event, wish I could join in the festivities but the timing is not right with having 2 kids maybe next years or so. East Texas "Longview Area" was my home base while I was overseas. Another Bump. Currently at 41oz. THANK YOU to all that have donated so far! We are only at 24oz so far. Tell you what, i'll even accept 1/2oz donations. I will be making these bars for sale this summer. The price will have a WFTW donation added into the price (prob $5), those that donate silver will have it waived if they buy bars. It would be nice to have a bar for each wounded soldier again this year, like last. A huge THANK YOU to those that have donated so far! Silver Addict wrote: Hey guys, we want to give the soldiers silver bars again this year. We have a really cool new stamp! We are looking for silver donations once again to make the bars to be raffled off. Hopefully we'll get enough donations that each soldier will receive a bar like last year. Anyone that would like to just buy silver shot from me instead of sending silver, is more than welcome. Unfortunately i bought on Monday before the drop and paid $20.43 an ounce for the shot. But, it is still cheaper than paying postage to send an ounce or two. We will be making both 1oz and 2oz bars for the event if we get enough donations. Please post below or send a pm to me or MaxGravy if you'd like to donate. I'm sorry, I never saw this thread till just now. I'll send you two (2) oz's. Can I send them out Thurs? Is that too late? Won't have access to them till then. Another Bump. Currently at 48oz. Cutting this off at midnight tonight. Would really be cool to hit 50oz! We are at 50oz! More donations are certainly welcome. Silver Addict wrote: Another Bump. Currently at 48oz. Pardon if this is necro-posting... but will a similar event be taking place THIS april (2015)? and if so, when should I send my silver donation? Me too, just let us know when and where to send it. The main event is focused on the soldiers and their families. It's not a fundraiser. In 2013 we raised silver donations and made bars to give directly to the soldiers. Last year we made stars and auctioned them off before the event with the money going to the WFTW. What would ya'll prefer? Make bars and raffle them off to the soldiers? Or make bars and sell them for donations? Or something different? We gave away bars last year as well. Silver Addict wrote: We gave away bars last year as well. You are correct. The square ones. I forgot. We could do those again. Might also drop my favorite LSU president's boss in with the silver.